We climb on our skis over the untracked snow, through the trees and up to a ridge. Where the ground drops away we can see over the snow-capped treetops to the valley below, framed by a horizon of glaciated peaks. A soothing silence envelops us. I find it hard to believe that we have reached the last of our nine weeks of training in Verbier. But the ride has been an eventful one. With a string of coaches we have spent many hours snaking down the slopes in short turns, carving across the piste in long sweeps, and poring over videos afterwards to hone our technique. We have revisited our own skiing journey, uncovering memories of being a novice so that we may teach with empathy. And we have accompanied instructors at work, discovering the skills needed to manage a class of tearful tots or a gang of fearless teenagers eager to attack mogul fields like a pack of pinballs. We have learned how it feels to be buried in an avalanche, and what we can do to avoid them; and we have qualified in basic mountain first aid, and know how to recognise the symptoms of ailments from anaphylactic shock on the piste to a heart attack in an après-ski bar. 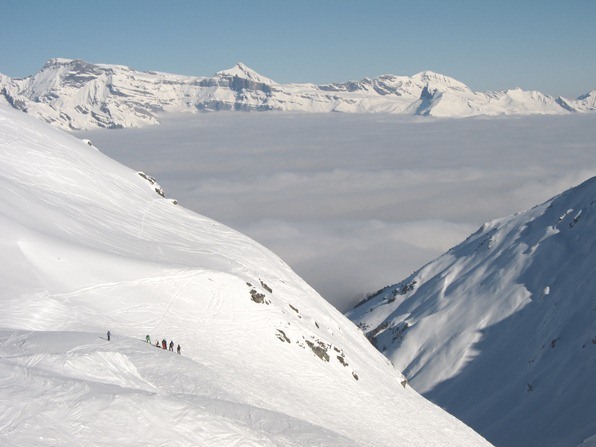 And we have skied day-in and day-out – in fog and under piercing blue skies, on ice and over powder, on and off the piste, across wide open bowls and in between the pines. 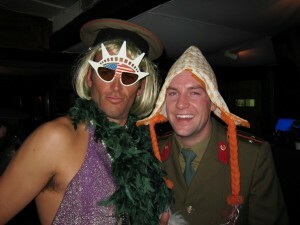 And each week we have survived we have celebrated in style, whether free-riding in fancy dress or dancing on the tables at après-ski. There have been setbacks in the form of injuries, but happy returns too: Alan, who went home to Aberdeen last month after injuring his elbow, is back this week, with the news that his arm was not broken after all. Of course the news of his engagement, in a classy restaurant in Geneva, as well as that of physio Susie, at the top of a mogul field, have been among the highlights of the course. I will miss seeing and skiing every day with fellow students who have become good friends. And I will also miss telling this story, for today’s instalment is my last. It has been a privilege to write about the people who every day live their passion for the mountains – from the inspirational trainers to the equipment gurus, from the instructors who choreograph the complex ballet that is ski school at half-term to the 250-kph speed skiers and the pastry chefs who create miracles of perfection in their ovens in the mountain huts beside the pistes. There are many more whose stories I wanted to tell: the mountain rescue workers, the helicopter pilots, the technicians who scale the giddying pylons of the cable cars and chairlifts festooned across the peaks and valleys. But time has run out; I hope I can tell them another season. I have also been inspired by people I have met who have used their creativity and ingenuity to indulge their love of the mountains in unconventional ways. Some juggle occasional stints as a ski instructor with part-time work back in the UK; others have set up home offices here, plying their trades online. If the price is a lack of traditional job security and paid holidays, the reward is a life in which work and leisure find a new balance. I know I am not the only student on my course with such thoughts going through my head. But for me, until now, they had been distant dreams, a nostalgic connection to childhood. Every year, for our family holiday, we would travel to the Swiss Alps, to the Italian-speaking region of Ticino. We would stay with my grandmother in the house in which my mother grew up, overlooking Lake Maggiore and the mountains beyond. My grandfather used to serenade them from his bedroom balcony, singing Verdi arias. I had a chance to stay longer in the Alps when I left school: working as an unpaid dogsbody for a gang of nuns at a mountain retreat high above Lake Lucerne. On the far side of the lake, perched on a high cliff, was a former grand hotel; according to the nuns, this now belonged to the Beatles’ former guru, the Maharishi Mahesh Yogi. His devotees, said the nuns, came here to learn yogic flying, and in idle moments between masses and dusting duties we would gaze across the lake to see if we could spot anyone going airborne. We never did. Yet the mountains did feel like a place where you could sprout wings, even if only spiritual ones; a place of transformation, where the spectacular vistas allow your soul to take flight. 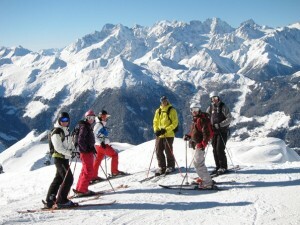 For now, though, my fellow students and I are still here in Verbier, our feet firmly on the snow. We have a final week in which to work on our ski technique and our instructing skills, and we all put in a final burst of effort. On the penultimate day of our course, G leads us to the start of a long off-piste route to the valley floor. At the top we have to negotiate a tricky passage between rocks, with a steep drop-off to one side, before we can reach the inviting powder way below. We all negotiate the passage successfully, and go on to enjoy a day of glorious skiing. Along the way, G has us give impromptu, unplanned lessons: a beginner’s guide to T-bar lifts; a session on how to ski safely in a whiteout; a workshop on skiing on ice. 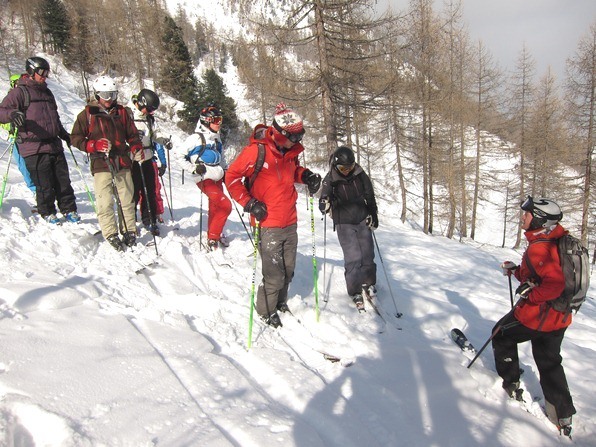 G makes his final observations in his continuous assessment for the BASI Level 2 exam that we need to pass in order to be able to work as instructors in the Alps. The next day, we learn that everyone in our group has passed. 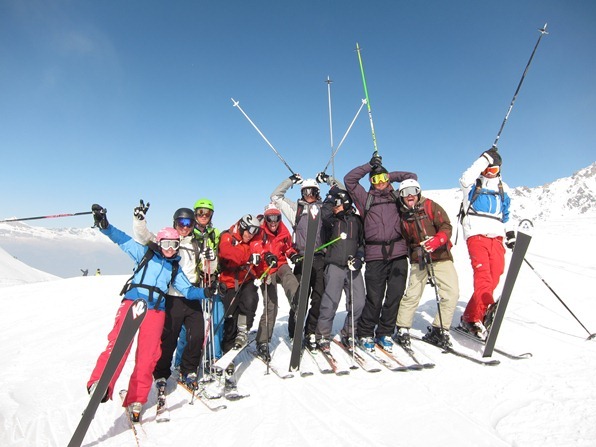 In fact, of three dozen-odd students that have entered the BASI Level 2 exam with the Warren Smith Ski Academy, all but one have passed. We are thrilled – and immediately aware of the possibilities opening up for us: for the school-leavers looking forward to long university holidays, and for the professionals pondering how to juggle our lives so that we can spend more time in future in the mountains. G points out that if we really want to work as instructors, we need to keep training: “This is just the beginning,” he says. And I think he’s right. 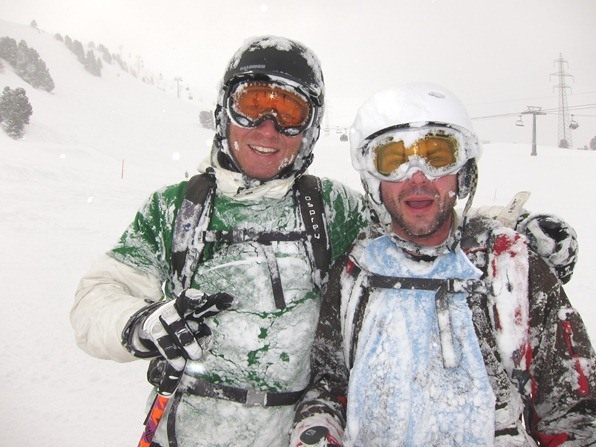 What do ski instructors live on when the snow melts? Can you make enough to survive the winter, let alone the other seasons? And what use is a ski qualification in summer? 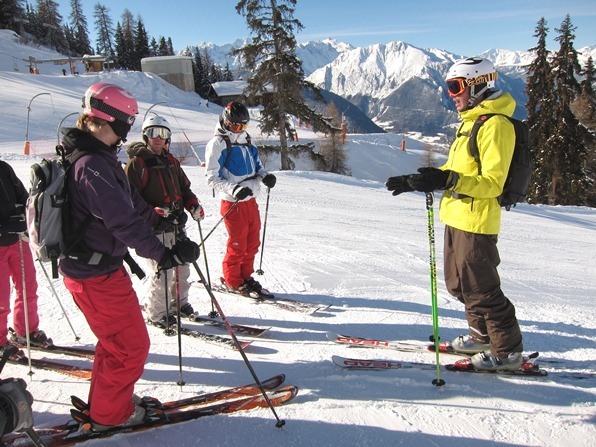 These are just three of the questions regularly asked by skiers – and of course would-be ski instructors. The first thing a professional instructor will tell you is that it takes time to build up work. 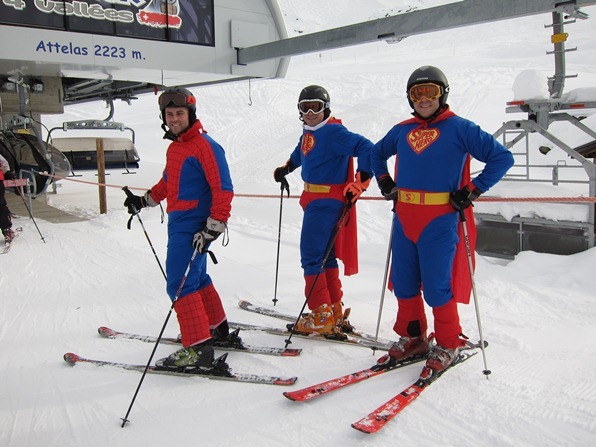 As a newly qualified member of staff at a ski school, you are last in the pecking order. You will be given classes at busy times – Christmas, February half-term, Easter – but in quieter weeks you may end up with none at all. 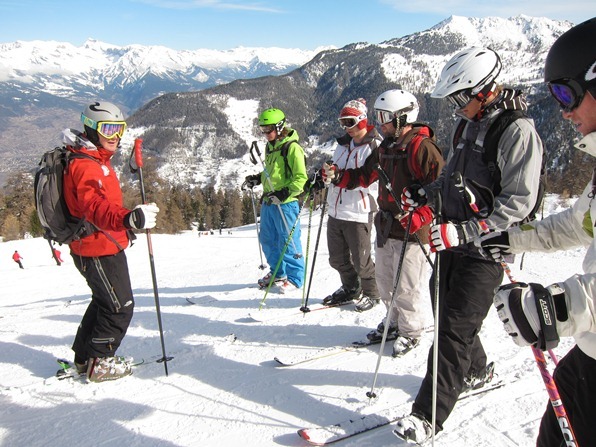 Starting pay for an instructor at a Swiss resort is typically £13-£16 an hour, so a novice will have a challenge making ends meet. However, instructors say that if you continue training, secure further qualifications, and gain a reputation for reliability and professionalism, your pay rate and workload will improve steadily. 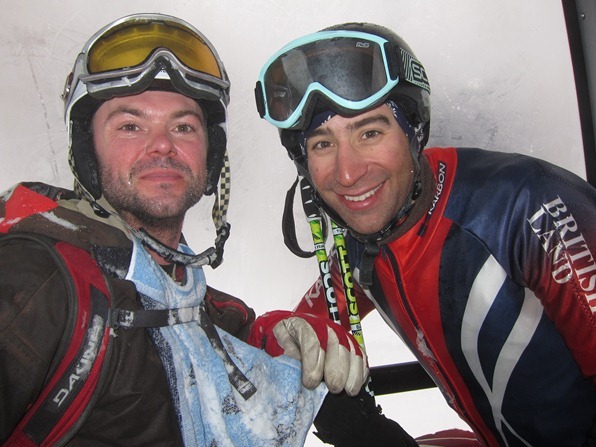 I asked three of the coaches at the Warren Smith Ski Academy about their own experience. Each has managed to turn their passion for skiing into a lifestyle that pays – but in very different ways. First, however, Scouse needed a skill that would get him to the Alps – so straight after GCSEs he did a year’s training as a chef, in Chester. 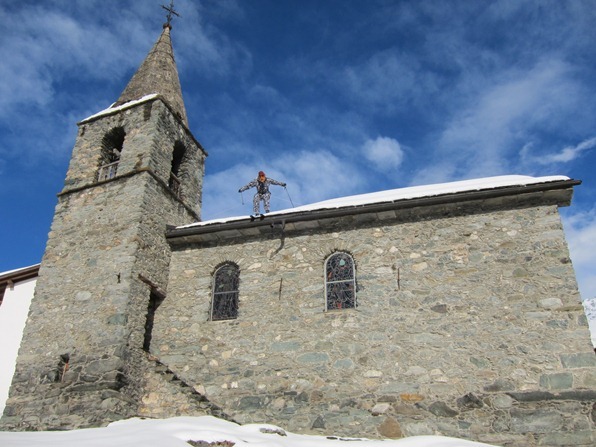 For two winters, he ran and cooked for a 20-guest chalet in Courchevel; in his spare time he trained as a ski instructor, as well as learning how to service skis “for beer money” (see blog 17). Scouse moved to Verbier where he built up his skiing experience and qualifications in subsequent winters, but summers proved more of a challenge. Initially he worked back home as a chef, but the long and unsocial hours meant he barely saw friends or family. The solution: a job at a factory packing Coco Pops, Cheerios and muesli – with every evening and weekend off. After four winters of ski training, Scouse landed his current job at the Warren Smith Ski Academy. 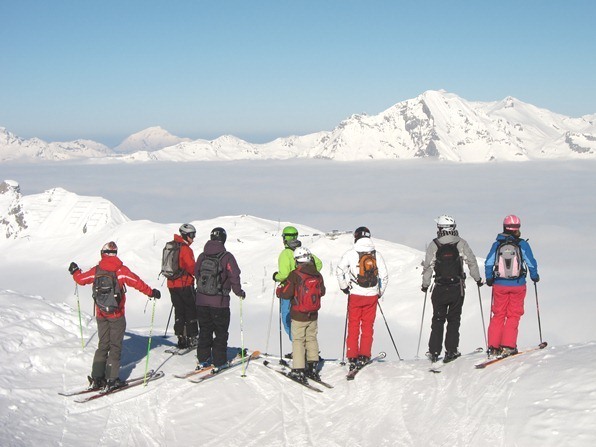 As well as running week-long ski courses and coaching future ski instructors, Scouse teaches summer camps on the glacier at the Swiss resort of Saas-Fee, and in the spring and autumn gives day courses at indoor artificial snow slopes around the UK. Which proves that you can make a living working on snow year-round as an instructor, even without setting foot in the southern hemisphere. The journey there, however, is anything but one long holiday. As we glide over the snow – dropping into dips, catapulted up again, feeling weightless at each crest and giddy at each switchback turn in the terrain – I feel as though I am on a giant natural rollercoaster. But today’s is a particularly scary thrill: this feels like a rollercoaster with no seatbelts and no seats, no arm holds. I’m just balancing on my bare feet. For this run, our coach has asked us to unbuckle our ski boots completely. At first, I panic. Usually I keep my boots tightly buckled, my ankle clamped solid, feeling safe knowing that if I fall my ankle cannot twist. Now my feet are wobbling in my boots, and my skis have taken on a life of their own: I feel as though I have lost all control. But as we skim over the slope, something strange happens. I realise that as soon as I am perfectly balanced over my feet, my skis start to glide smoothly over the curves in the terrain, like flowing water. And I have a sensation that I have only previously experienced on a surf board: of sliding over waves, feeling through my feet every ripple in the liquid landscape as it passes underneath me. The man who is encouraging us to have these unfamiliar feelings is Gherardo Gambaro, aka G. This Italian-born skier is a trainer with BASI, the British Association of Snowsport Instructors (www.basi.org.uk), and this week and next he is coaching us through our Level 2 exam – the culmination of our nine-week course to train as ski instructors with the Warren Smith Ski Academy (www.warrensmith-skiacademy.com). G picked up many of his skills from his father, who would ski carrying his son in a backpack until G was old enough to put on his own skis, aged four. Growing up in the Alps near Turin, G developed a love of the mountains, as well as a taste for adventure. At the age of 17 he cycled around Iceland on a mountainbike, and four years later crossed the island on foot, spending four days traversing the sea of ice at its heart. The following year he cycled solo across Australia, from Adelaide to Darwin, in 21 days. Another time he paddled 2,000 kilometres in an open canoe, with a friend, down the Amazon: “the hardest thing I’ve ever done,” he says. On one of his trips G met a woman from New Zealand, and ten years ago moved there to set up home and start a family. In between he has skied, trained and taught both in the Southern Alps and in Europe, clocking up 20 seasons, during which he has trained to the highest level in the New Zealand, British, Italian and Swiss training systems. One of G’s suggestions is that to work on improving my balance back home, I learn to ride a unicycle, take classes in ice skating, and if I go to a gym, do my workouts perched on a Swiss ball or a wobble board. Balance, it seems, is all-important. As we do our training, skiing around on one leg or with boots unbuckled, exploring the limits of our ability to balance, memories return of my very first sensations of skiing, decades ago. I recall the fear of sliding out of control, of losing my balance, of falling; and feel again the sense of achievement from gliding freely over the pristine landscape, as if surfing the white waves on the mountain. Understanding novice skiers, I realise, will be much easier after this. I am reminded, too, of one of the things I love most about skiing. The fact that when you concentrate on balancing on the snow gliding under your feet, focusing on your intensely personal and intimate dance with the mountain, your head clears of any other thoughts. You cannot live in any moment but the present, or you will fall. I find this more relaxing to the mind and soul than any beach holiday, book or sunlounger. Give me movement any day: gliding through a pristine landscape, senses tuned to nature, and balancing free in the here and now. The fine art of spending as much time on the slopes with the minimum effort and expense. An embarrassing thought struck me as I left the supermarket early in the season brandishing my new purchase: what true ski bum would waste precious beer money on a hot-water bottle? I hurriedly concealed it under my jacket. For a genuine ski bum, the only possible bedwarmer is the person who is providing you with free accommodation at a ski resort. Definitions of a ski bum seem to vary, but as far as I can make out – after weeks of investigation here at the Swiss resort of Verbier– the essence of the lifestyle is an endeavour to ski as much as possible for the least amount of work. If you can get away with not working at all, so much the better. You do not have to stay all season in a resort to qualify as a ski bum: you can enter into the spirit of the lifestyle on a short holiday. A fellow student on my course to train as a ski instructor at the Warren Smith Ski Academy, Susie the physiotherapist – who recently got engaged at the top of a mogul run – once spent a holiday with her now fiancé touring Swiss resorts such as Davos, Zermatt and St Moritz, sleeping in the back of their unheated Mercedes Vito van and living off soup and pasta. Her survival tip: stop as often as possible at sports centres, to thaw out in hot showers. I made a rather pathetic attempt to be a ski bum myself when I left school aged 18. I bought skis in a charity shop – an ancient, ridiculously long pair, with heavy steel bindings – and found what I thought was the ideal job in Chamonix, mucking out the horses of a man who offered horse-drawn sleigh rides. Accommodation was free of charge – in a disused chicken hut next to the stables. As the temperature was well below zero day and night, the hut wasn’t too whiffy – and when it got grubby, all I had to do was rip up an empty sack of horse feed and lay down a new carpet. Every night I ate pasta cooked on a camping stove. Unfortunately my income was insufficient to cover a lift pass, so after about a month I left with no money, and virtually no ski experience. In fact, not doing much skiing is a surprisingly common activity among would-be ski bums: the important thing seems to be the public declaration that you’re going to spend all day and every day skiing your heart out, even if you don’t quite get round to it. Another student on my course, Aidan – a pharmacist back home – also headed out to the Chamonix valley a few years back for a season’s skiing. He spent December failing to find work – the snow did not fall until Christmas, so few businesses were taking on staff – and decided instead to make sure he was perfectly equipped for all the skiing he was going to do. But as a result of “being too aggressive trying on ski boots,” he irritated his Achilles tendon – and ended up with his leg in plaster. Make creative use of all those zips on your ski jacket and trousers: after a meal or drink, laboriously unzip them one by one “looking” for your money; but the time you get to the tenth one, someone will have lost patience and offered to pay for you. … and ski your heart out, for the exquisite unadulterated joy of it, until the last lift has stopped working, all the snow has melted – and you have to decide what to do with yourself all summer. James Bedding is attending a training programme to qualify as a ski instructor with the Further information: the Warren Smith Ski Academy (www.warrensmith-skiacademy.com), the Switzerland Travel Centre (00800 100 200 30, www.MySwitzerland.com) and the local tourist office (www.verbier.ch).